Advantages: Interesting and otherwise neglected story of the Messerschmitt Bf 110 heavy fighter units; concise and interesting narrative; large, relevant photos; great profiles - terrific inspiration for modellers. The Classic Colours Luftwaffe Colours project is an ambitious series of books written by an ensemble cast of some of the best respected Luftwaffe experts from around the globe. The focus of the series is the camouflage and markings of Luftwaffe aircraft from the first tentative challenge to the Treaty of Versailles to the end of the Third Reich. The Jagdwaffe section has recently come to a conclusion with 20 books in that series alone, but Classic Publication still have plenty of ground to cover. 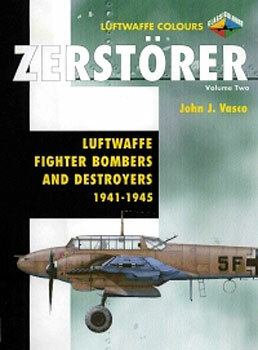 Zerstörer Volume Two chronicles the Luftwaffe Messerschmitt Bf 110 heavy fighter units from the beginning of 1941 until the last days of the war in Europe. This is another fascinating yet largely neglected corner of Luftwaffe history. Considered at its inception to be the elite arm of the Luftwaffe, the reputation of the Zerstörer units was left in tatters after the Battle of Britain. Even so, these heavy fighters continued to deliver useful, if sometimes ill-targetted, service to the Luftwaffe right up to the close of hostilities. This second volume commences with the redeployment of the Zerstörer Gruppen to the Balkans, Greece, North Africa and the Middle East after the debilitating Battle of Britain. Operational history of Bf 110 units on the Russian Front also occupies a significant proportion of the text. The narrative concludes with discussion of Reich Defence duties. The book comprises 96 pages in the familiar large format (303mm x 206mm) of the series. The text deals almost exclusively with operations. Around 200 photos, mostly of the aircraft of the period, are one of the highlights of this title. Captions are detailed and relevant, and provide useful information about the colours and markings of the subjects. The side profile illustrations are very attractive and much more varied than the examples in the first volume due to the transition of camouflage over this relatively long period. Coverage in text and pictures is almost exclusively devoted to the Messerschmitt Bf 110. Although the Bf 110 was undoubtedly the backbone of the Zerstörer Gruppen (in fact, the vast majority), it is surprising that other types such as the Ju 88C and Me 410 are not discussed. There is, however, a half a page outlining the early woes of the Messerschmitt Me 210. As always, this book in the Classic Colours series is well suited to modellers and, with its narrative focus on operations, will appeal to Luftwaffe historians too.